The rider can only stay in control of his position, no matter the situation, by learning to control his mind. This is the goal of the exercise in this session. A very easy to set-up exercise proven to be effective in getting the horse and rider to stay alert mentally and physically for whatever situation that could arise. 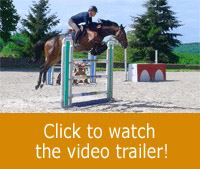 When a rider needs to slow down or speed up, turn, or approach a jump, he tends to change his position: he leans to the left to turn left, moves the shoulders forward to anticipate a jump, pushes his seat back to speed up….However, all those changes in the position are working against the correct rider’s seat and horse’s movements. It is a real handicap as the rider gets into a position where he cannot ready himself for the next step in an effective manner. This kind of situation will lead the rider to take inappropriate actions in order to make the situation better. These changes will lead the horse to a lack of understanding and some physical disruption. As Michel likes to remind us: “If you are ready for a movement, you should also be ready for the opposite: going to the right or to the left, going faster or slower…” The rider has to be aware that the horse is the one who executes the movement and not the other way around. Hence the convenience of staying centred in the position of reference whatever the movement to execute. One more time, the rider will only be able to control his position no matter what happens by learning how to control his mind. 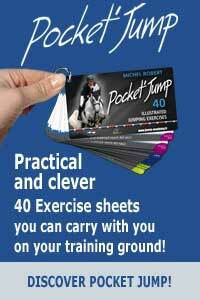 This is what Michel explores in this exercise which is not only easy to set up, but also proven to be really effective in getting the rider to stay available mentally and physically and ready for everything. Sélène is showing us how to practise this exercise. She rides Amore an 8 YO gelding. We can notice that when the rider is in a neutral mind-set, her position allows her to do everything: turn to the right or to the left, stop, or go jump….with very little influence on her horse who is available and responsive.